Much of the handwringing by greens over the new climate and energy bill introduced in the Senate on May 12 has focused on the overtly controversial aspects of the legislation: the partial allowances it makes for new offshore oil drilling, for instance, and the ceiling it puts on carbon prices. Others have complained that the bill  which calls for a 17% reduction in carbon emissions below 2005 levels by 2020, and eventually an 83% cut by midcentury  is far too weak to meet the scale of the climate crisis. Somewhat overlooked in the dialogue is another important concession that the authors of the 957-page bill, Senators John Kerry and Joe Lieberman, made in hopes of appealing to a maximally broad coalition of backers, including both the fossil-fuel industry and crunchy greens: eliminating dedicated funding for a major part of the global environmental agenda, rain-forest preservation. Tropical rain forests hold billions of tons of carbon, and when they're cut down or burned, they release those gases into the atmosphere  enough to make deforestation responsible for approximately 15% of global warming emissions. The climate bill passed by the House last June set an ambitious goal of conserving the carbon trapped in forests equal to 10% of U.S. emissions, and in doing so, set aside 5% of total emissions allowance value from carbon auctions, which could bring $3 billion to $5 billion a year, to the protection of forests in developing nations. But while the Kerry-Lieberman bill in the Senate has the same broad goal for conserving forests, it devotes no specific funds to stopping deforestation. And we all know how well unfunded mandates tend to turn out. "It's a considerable step backward," says Doug Boucher, chairman of the Tropical Forest and Climate Coalition, which consists of environmental groups, power utilities and other companies. The Senate bill excludes private-sector investment in rain-forest conservation for the next 10 years. Under the House bill, private companies that invest in rain-forest offsets  paying to keep trees standing in tropical countries  could generally claim credits against their carbon cap. Under the Senate bill, they won't be able to do so, for the most part, unless tropical nations already have a national or state-level deforestation cap in place, which will likely take years to develop. (Although there are a number of early efforts under way around the world, no rain-forest nation has yet put a firm state or national cap on deforestation.) That's a major blow to the development of a global conservation process called REDD  Reduced Emissions from Deforestation and Degradation  which would allow developed countries to invest in rain-forest protection in the tropical world in exchange for carbon credits. 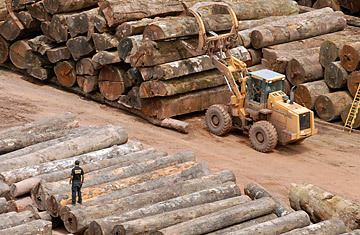 International forestry offsets are considered a relatively cheap way to reduce carbon emissions  although it will be tough to authenticate forestry reductions, especially at the outset  and a number of power companies have raised concerns that the changes in the Senate bill could make it more expensive. Many environmentalists had also hoped that REDD could be a major new source of conservation funding that would be sustainable over the long term. (Rain forests are home to some of the greatest biodiversity on earth.) But if REDD isn't a part of a U.S. carbon cap, it may never reach its potential. "It turns what was a win-win into a lose-lose for the forests," says Glenn Hurowitz of Avoided Deforestation Partners, an international network of REDD supporters. At least some of the money that would have been allocated to deforestation under the House bill will be going back to consumers under the Senate bill  two-thirds of the revenue from carbon auctions in Kerry-Lieberman will be refunded to Americans. That might be a necessary strategic compromise  one of Kerry and Lieberman's toughest tasks is to try to convince the Senate that any of the income from carbon sales should be shipped abroad, to help with carbon mitigation or climate adaptation in other countries. "[Kerry] has made the argument to us and other advocates that anything international is going to be heavy lifting until there's a global climate deal," says Nathaniel Keohane, director of economic policy and analysis at the Environmental Defense Fund, a major supporter of the bill. "We will try to work with others to improve that." The good news is that forest conservation will not ground to a halt entirely without REDD. On Tuesday, 20 major timber companies and nine leading environmental groups signed a major agreement: more than 170 million acres of pristine boreal forest in Canada  an area bigger than France  that had been slated to be logged will be sustainably managed instead, and 70 million of those acres will be kept untouched for now to protect endangered caribou. It is the biggest single forest conservation agreement ever, although it deals with northern boreal forests rather than tropical rain forests. "The importance of this agreement cannot be overstated," said Avrim Lazar, president and CEO of the Forest Products Association of Canada. But as heartening as the Canadian pact is, it won't protect rain forests and it won't get REDD going. Although the Senate bill does give the President the authority to designate up to 5% of carbon revenue to deforestation or other international aims within the context of a global deal, which is meaningful, it's not as effective as specifically dedicating money to stop deforestation. Further, limiting REDD in a U.S. climate bill could make getting a global deal  already a near impossible challenge  even tougher. REDD was one of the few areas that showed glimmers of promise at the chaotic U.N. climate summit in Copenhagen last December. "It is definitely one of the brighter spots in the global talks," says Boucher. "Hopefully we'll be able to fix this as the bill goes forward." But as the Senate bill stands now, REDD could end up dead.